In his 1999 debut with the METROPOLITAN OPERA, New York, as the Count di Luna in IL TROVATORE, the NEW YORK TIMES wrote, Genaro Sulvaran has a dark-hued voice and sings with a dramatic vigour. 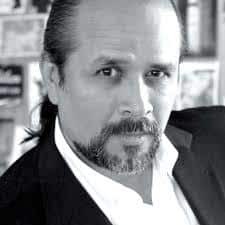 Genaro Sulvaran resides in Mexico and began his operatic career in the role of Escamillo in CARMEN at TEATRO DE BELLAS ARTES in Mexico City 1991. He since has become a most sought after baritone, international critics emphasising his dramatism, theatrical presence on stage and his powerful dark voice characterise him as a “singing-actor”. His international career includes the leading baritone roles in MACBETH, OTELLO, RIGOLETTO, NABUCCO, SIMON BOCCANEGRA, UN BALLO IN MASCHERA, AIDA, LA TRAVIATA, IL TROVATORE, TOSCA, LA BOHEME, ANDREA CHENIER, CARMEN, LA GIOCONDA, LUCIA DI LAMMERMOOR, CAVALLERIA RUSTICANA, SAMSON AND DELILAH, DON GIOVANNI, LE NOZZE DI FIGARO, ELECTRA and THE FLYING DUTCHMAN and ARIADNE AUF NAXOS, for such houses as TEATRO COLON BUENOS AIRES, TEATRO MASSIMO DI PALERMO, TEATRO PERGOLESI DI JESI, THEATRE L’ACQUILA DI FERMO, TEATRO GIUSEPPE VERDI DI TRIESTE, TEATRO MUNICIPAL RIO DE JANEIRO, TEATRO LA MAESTRANZA SEVILLA, TEATRO VILLAMARTA JERÉZ DE LA FRONTERA, TEATRO CERVANTES MÁLAGA, TEATRO EUSKALDUNA BILBAO and the BISCAYA ARENA BILBAO, PALAU SANT JORDI BARCELONA, TEATRO CERVANTES MALAGA, TEATRO CUYÁS LAS PALMAS DE GRAN CANARIA, AUDITORIO PRÍNCIPE DE ASTURIAS OVIEDO, GUIMERÁ THEATRE SANTA CRUZ DE TENERIFE, PALAIS DES FESTIVALS DE SANTANDER, PALACE OF CONGRESS LA CORUNA, THE HONG KONG OPERA HOUSE, TEATRO DE BELLAS ARTES SAN JUÁN, TEATRO DE LA OPERA BOGOTA, KALAMAZOO SYMPHONY HALL, and the SEATTLE OPERA. He appeared as Rigoletto in Elijah Moshinsky’s OPERA AUSTRALIA production at the 2007 MACAU INTERNATIONAL MUSIC FESTIVAL. His recordings include LA TRAVIATA, with soprano Cristina Gallardo-Domas as Violetta, under the baton of Enrique Patrón de Rueda and with the Malaga Philharmonic Orchestra for RTVE and SIMON BOCCANEGRA from TEATRE PRINCIPAL DE PALMA, recorded live for DVD. Most memorably, in 1997, Genaro Sulvaran was invited to appear with Placido Domingo in a gala concert hosted by the President of Mexico at the PALACIO DE BELLAS ARTES in honour of the King of Spain. His performances, during the 2013-2014 season included the title roles in Wagner’s THE FLYING DUTCHMAN for OPERA DE BELLAS ARTES in Mexico City, conducted by Niksa Bareza and in RIGOLETTO at the TEATRE PRINCIPAL DE PALMA in Majorca. He returned to OPERA DE BELLAS ARTES in Mexico City for Escamillo in CARMEN and Scarpia in TOSCA during the 2015-2016 season.